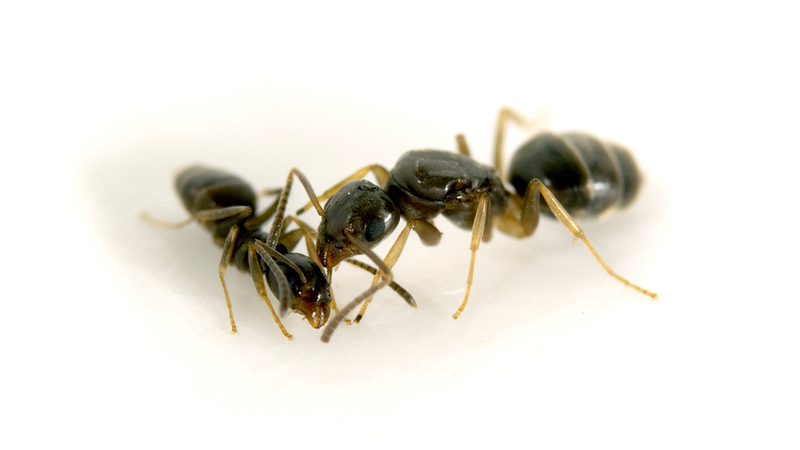 If you live in the United States, you’ve probably seen an odorous house ant (Tapinoma sessile) – one of the most common ants in the country. And for more than 50 years they’ve been described as smelling like rotten coconut. But Clint Penick thinks they smell like blue cheese. And he can prove he’s right. Penick is a postdoctoral researcher at NC State. Most of his work revolves around ants, and for years he’s been fascinated by the fact that you can identify some ant species by smell – such as T. sessile. But after grad school he moved to North Carolina, where T. sessile are common. And when he found some T. sessile in his own backyard, he moved in for a sniff. Blue cheese. Not coconut-y at all. When he dug the coconut up a week later, it was covered in a blue mold and smelled exactly like…blue cheese. When they tested it, Penick and Smith learned that the Penicillium mold on the coconut produces the same methyl ketones found in blue cheese. “This was something Adrian and I did for fun – it’s not something we spent tax dollars on,” Penick says. “But while this started out as a joke, we got some interesting findings. “For one thing, we’ve learned something new about one of the most common household pest species in the United States, and it’s something people can use to describe the species to homeowners, students, and entomologists. A paper on the work, “The true odor of the Odorous House Ant,” is published in the spring issue of American Entomologist.